If you plan on studying abroad in college, we don't have to tell you how important it is to keep track of your passport while you're abroad. Even if you really like the location where you're studying at, you don't wan to be stuck there because of a lost passport! So instead of keeping that passport in your pocket or not even having a designated area for it, try our Pink Trim Damask 3 Zipper Passport Bag. This bag for college girls is just the right size for holding your passport and other small college items. While you're abroad, you'll be doing a lot of walking and a heavy purse or backpack can really weigh you down. That's why this small, cheap passport bag is a much-needed college essential that's just the right size. Even if you're not studying abroad while in college, you'll still be doing plenty of walking around campus and will require a college bag for holding your dorm stuff while on the go. This bag for college girls can act as a wallet or even a snack bag. 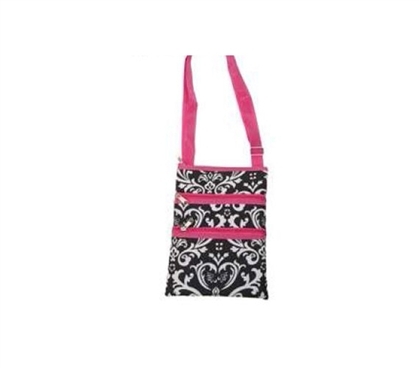 If you're just headed to one class and you don't want to lug a backpack or large purse, this mini-bag is perfect. After all, what's a girl to do when she doesn't have pockets on her pants or dress? You don't want to show up for class not even having a pen, so use this cheap college bag to hold all those smaller college supplies.